Our Economy series radiators are designed for car enthusiasts looking for an affordable cooling solution for their classic car that is nearly stock condition. 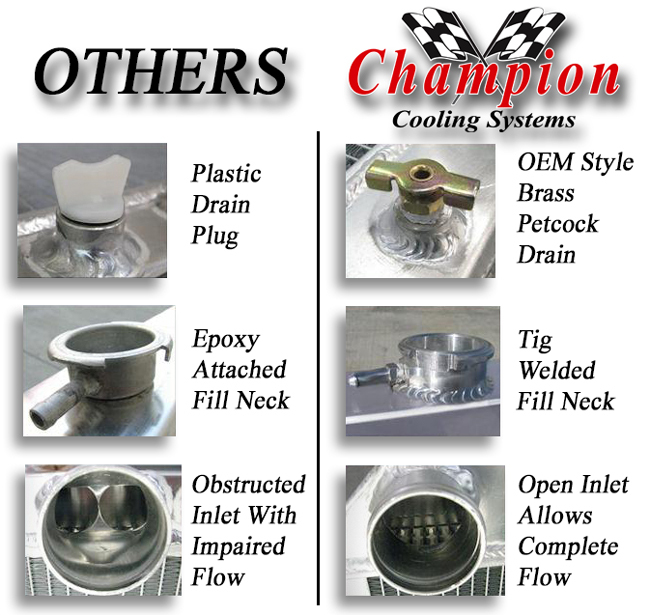 Though some muscle cars or modified vehicles with a higher horsepower rating may require one of Champion Cooling’s three or four row radiators, these economy series radiators are built with two-row brazed aluminum cores that are tig-welded to aluminum tanks with approximately 14-16 louvered fins per inch, a brass petcock, and all are designed with aircraft grade aluminum. The tubes are 3/4” thick with a 1 1/2” core. In most cases this all aluminum design allows for stronger wider tubes that enable a two row aluminum radiator to outperform a three row copper brass of equal dimensions, while also being more affordable and lighter weight. We recommend this series for most applications with 500 horsepower or less. Champion Cooling brought the Economy series of radiators to market with the goal of not only making a product our customers would be proud to show off, but also designed to the highest standard while still making it very affordable. You could easily spend between $450 and $950 on a comparable two-row radiator from one of our competitors. We have an amazing customer service team available by phone or by email so if you have any questions, please feel free to give us a call.